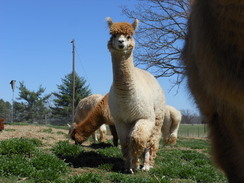 Ellie is probably the most friendly alpaca in our herd AND that great personality does not change a bit when she is pregnant. Ellie is gentle, easy to handle and always ready to give kisses when we are busy doing barn chores. Ellie gave birth to her first cria 05/23/14 and wow did she do GREAT as a first time mom. 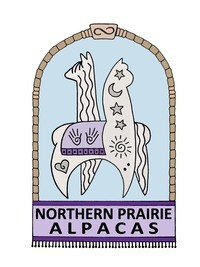 IgG level for her HDF Prince Phillip offspring was off the chart; her gorgeous male cria is named Prince Phillip's Royal Spirit and for the first few weeks he gained 1.0 pound or more daily! Not bad for a first time dam who gave birth to a cria that weighed in at 23.3 lbs and at 4 weeks old was 50 lbs. Ellie produced another awesome female cria sired by Rainman in the spring of 2017. Her cria, Carmelita Grande (yes, another big baby!) is a rich caramel color with very fine fleece. Carmelita definitely got the best genetics from both of her parents including an outstanding disposition.